Why be a member of the Microsoft Tech Community? The Microsoft Tech Community is a place to interact with IT Pros, Developers and end-users along with Microsoft. The focus of the site was initially on Office 365 but now encompasses Azure, Enterprise Mobility + Security (EMS) and many other Microsoft technologies. This article covers how the Microsoft Tech Community came about, guidance on joining and why it’s worth becoming a member in the first place. 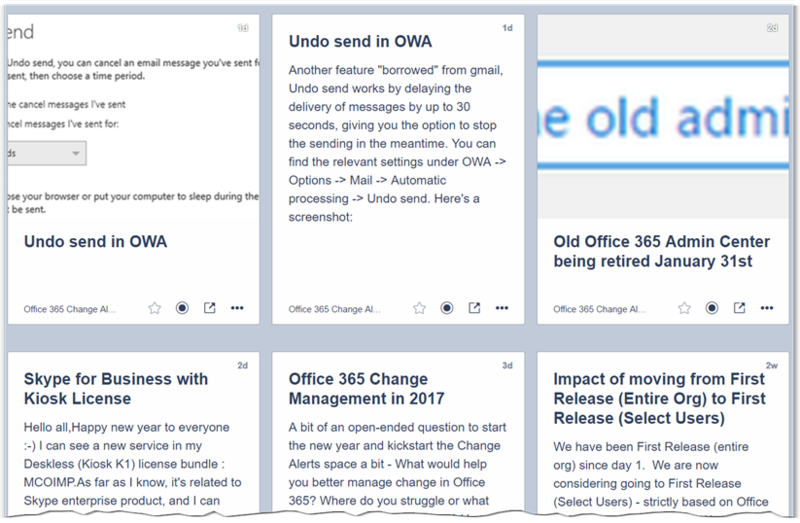 The use of subscriptions, notifications and RSS feeds are also covered along with some recommend communities to join for Office 365 IT Pros, power users and enthusiasts. There are also recommendations for Enterprise Mobility + Security as well. The website address for the Microsoft Tech Community is https://techcommunity.microsoft.com. There is also an official Twitter account as well - https://twitter.com/mstcommunity. The new Office 365 Network was subsequently renamed to the Microsoft Tech Community, with an expanded focus on other Microsoft products. The original, Yammer- based Office 365 network has since been closed. Microsoft is using a platform called Lithium Technologies Online Communities for the Microsoft Tech Community. There is no mobile app for the Microsoft Tech Community but the site works well in mobile web browsers. It's worth remembering that the Microsoft Tech Community isn't an official technical support forum. It is possible though to get assistance from like-minded Microsoft customers, Microsoft Most Valuable Professional’s (MVP), as well as other experts and Microsoft staff, who will sometimes be able to chip in. Getting Started Guide Part 2 comes with a Step-by-step intro of the Microsoft Tech Community video, introduces Communities and Spaces, as well as how to contribute to the community. The use of RSS feeds is also discussed. There is also some Microsoft Tech Community Guidelines that covers do's and don'ts as well as explaining what the different badges mean, which appear on some member’s avatar. After logging in to the Microsoft Tech Community, setting up a profile and other preferences, it time to dig deeper and look at what the community offers. Communities are for different Microsoft Products and Solutions. Members can join communities that interest them. Within each community, there are Community Spaces, places for discussions and ideas that sit within a community. Members can favorite Community Spaces that interest them. 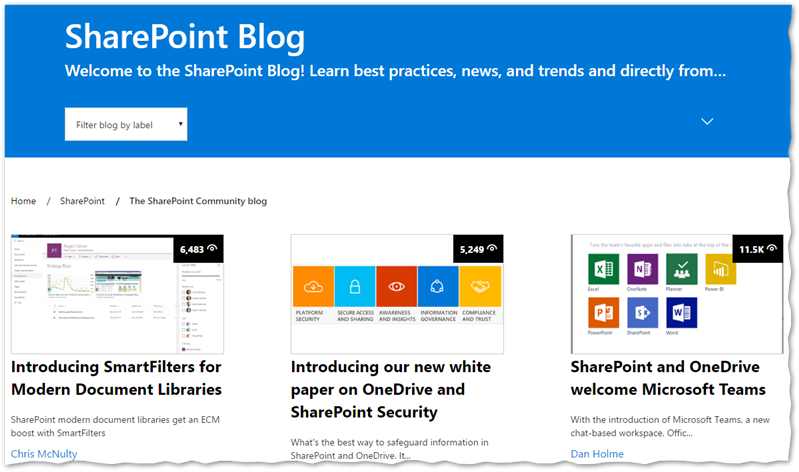 On the Microsoft Tech Community home page members will see the latest activity, trending spaces and the latest blog posts, that shows the five latest blog posts. At the top of the every page, there are navigation elements including Communities, showing every available community, Blogs includes all the latest blog articles and a heart icon, which shows all the spaces, communities and blogs that a meber has joined. By clicking on "My Home" from the heart icon, a “My Feed” will be displayed. This is a way to stay up-to-date with posts based on newest, popular, by experts or unanswered posts. Also “My Favorite Spaces” and “My Communities” will be shown, which is a great way to keep track of what areas are being followed. 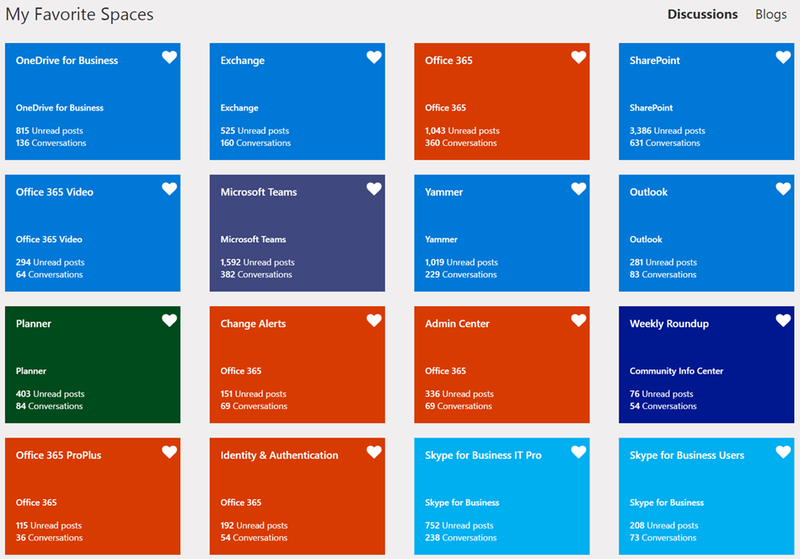 Here are some recommended communities and spaces for IT Pros, power users or enthusiasts to join, who manage or are interested in Office 365. This is only a suggested starting point and will depend on which areas are of most interest. The Weekly Roundup space from the Community Info Center community is also recommended, as is Driving Adoption community from the space of the same name. Some communities have blogs as well. These contain Microsoft written articles and are well worth following. These blogs are quite easy to miss, the navigation is shown when browsing a community with a blog, in this example the SharePoint community. Selecting the Blogs heading, as highlighted, will show the available blogs. See also this other Technet Wiki article for an introduction into EMS and all its components - Enterprise Mobility + Security Guide. 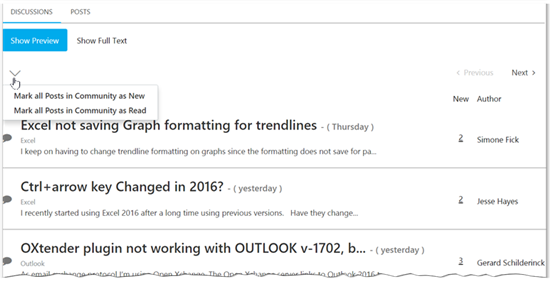 With so much happening on the Microsoft Tech Community, new conversations or replies, new blogs, regular news roundups, staying up-to-date is easy with the following options. By subscribing to posts, anytime there is new activity, a notification will appear or an email will be sent. This makes it easy to follow along with developments even when away from the Microsoft Tech Community. When participating in a conversation, the user is automatically subscribed to the post. Optionally the user can subscribe to any topic of interest by selecting the option from the 'Conversations Options' option that appears in all posts. Notifications appear, overlayed on the user's avatar, with the number of new notifications. Also when clicking on the avatar, there is a visual indication of how many unread notifications which are shown beside a flag icon. By clicking this icon the Notification Feed is shown. This shows recent notifications including when there is a new reply to a subscribed post, if a like has been given or if the user has been mentioned. Email notifications are sent as well, for example with replies to a topic that the user has subscribed to. This includes the contents of the reply, so the user can follow along as new replies are posted. Notifications and emails are configurable by clicking 'My Settings', which appears after clicking the avatar. In the 'Subscriptions & Notifications' section and under 'Notifications Settings' there are numerous options for changing the defaults including email frequency. There are options for Daily and Weekly digests as well. Finally, after clicking the avatar there is a 'My Subscriptions' option, this brings up a list of all subscriptions, any of which can be deleted if required. Staying informed of new posts is worthwhile, many spaces have a lot of activity and it's easy to miss a topic that may be of interest. One way to help with this is to subscribe to community spaces using RSS. 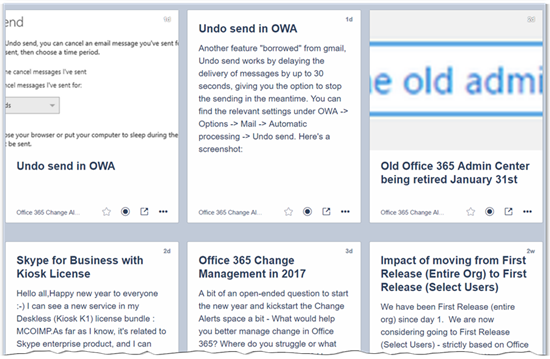 Every space, shown below is the Office 365 Change Alerts space as an example, has a drop down menu with a 'Subscribe to RSS Feed' option. This option is available even without joining the Microsoft Tech Community. A feature that isn't yet officially listed but is part of the underlying forum software, is unread discussions. This provides a way to view unread posts that haven't been read yet or all threads that haven't been opened yet. This list is personalised for the logged in member and will change accordingly. 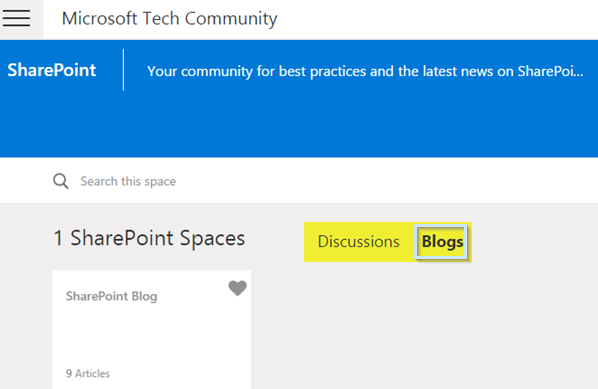 Simply visit this specific web address to see this in action - https://techcommunity.microsoft.com/t5/forums/unreadpostspage/tab/thread. There is an option to "Mark all Posts in Community as Read", this will set all items as read, leaving nothing new to display. As new discussions or posts to threads are added these will appear in unread discussions. The Microsoft Tech Community is a place to interact, ask questions, share ideas or observations with peers, developers, end-users as well as Microsoft. While there is a strong focus on Office 365, many other Microsoft technologies are represented. By joining, members can better stay up-to-date with new developments, make them more informed, contribute ideas and ask questions, as well as help fellow members.